I was curious. 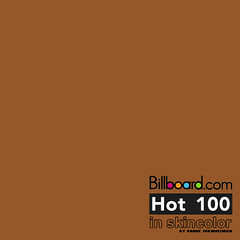 Turns out the average skin color of artists on the Billboard Hot 100 (in March) was #96582B, as you can see in the image below. The complete graph, for March, can be seen near the bottom. The graph was put together based on the charts as listed on the Ultimate Music Database. 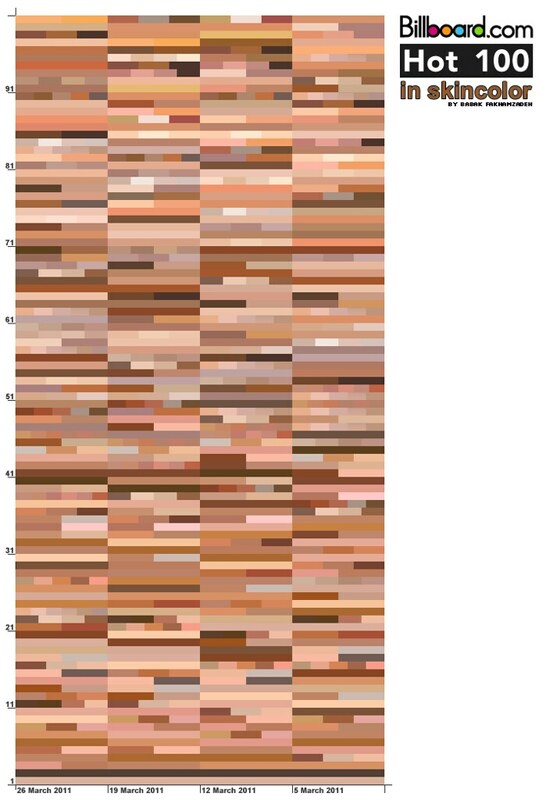 The skin color of individual artists was taken from, when possible, candid photos, from which a ‘normally’ lit piece of skin was taken, this resized to a 1×1 pixel and then blown up again. This was occasionally tricky as many artists push their studio approved, nicely photoshopped, portraits, while plenty of ‘candid’ shots of artists are actually shot at high profile events under bright lights. 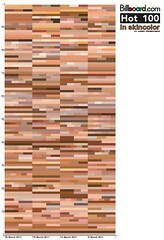 When multiple artists collaborated on a song, I split that song’s position on the chart into, at maximum, 6 individual slots for up to 6 individual artists. The only listings on the Billboard Hot 100 which were performed by more than six artists where the songs from the ‘Glee cast’.